The IQInvision IQEye3 is an intelligent network camera with leading edge performance and a 1.3 Megapixel color imager. 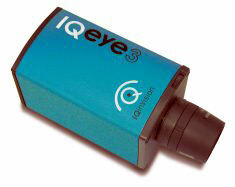 Capable of over 1.8 Mpixels/second JPEG performance the IQeye3 is a perfect solution for a wide array of applications. Very low power requirements and flexible network connectivity make the IQeye3 perfect for deployment in a wide variety of environments. The optional IQpoet (Power over Ethernet) make the IQeye3 easy to install and maintain. The IQeye3 platform contains a fully functional network computer that makes it possible to watch live images using a web browser, configure the camera to email and/or FTP images based on triggers or time lapse settings, or embed custom web pages. Uncompressed images are available over the network for the programmer, but be prepared with a dedicated 100 Mbps network, because the IQeye3 produces an uncompressed stream that will flood a shared Fast Ethernet network. In contrast, when providing compressed streaming JPEGs an IQeye3 typically uses only 1 to 2 Mbps of a shared network.